She had been pressing through for more than twelve years, pressing through her pain, the relentless outflow of her life’s blood, the slow drain of her resources, and now this crowd. She had heard of Jesus, the one who did wonders and miracles and she decided that He was the one she needed to get to for her healing. In her weakness she only caught fleeting glimpses of Him through the multitude. So frail was she from twelve years of life draining from her, that her slight form was tossed back and forth by the jostling crowd like a broken limb upon the pounding surf. But she was making progress. Each small glimpse of Jesus seemed to bring her a little closer. He was moving away from her through the crowd and she thought it hopeless that she would ever reach Him. Yet she was getting closer. She had no strength left to spend in wondering how, but this small, private miracle helped her focus her remaining energy on reaching Him. She had to press through. Perhaps the crowd slowed Jesus some. Everyone was pressing, reaching, yelling. From the words around her that somehow penetrated her flint-like focus she heard that a ruler from the synagogue, Jairus, had asked Jesus to come to his house and touch his little girl who was at the point of death. This news slowed the woman a bit as she thought that perhaps she should not delay Jesus. Her life was spent, worthless, gone to the doctors and to the illness. The little girl had life stretching before her, if Jesus could make it through the crowd. What right did the woman have to delay Him? The daughter of a ruler of the synagogue must surely be the priority. The woman was anonymous, unnoticed by anyone, written off as already dead by her family, forgotten by friends and of no interest to physicians who could not help her and for whom she had no funds. This broken limb began to let herself be washed out to sea. Weariness overcame her. She stopped for a moment and a large man behind her seemed to lift her and push her onward, a friendly wave on the hostile sea. She opened her eyes and there Jesus was before her. His strong back seemed to beckon her hand. Could she reach Him? She stretched. A little more. Once more. And her hand touched His cloak. Something we would call electricity but something for which she had no name, ran through her outstretched arm and into her frail body. As the virtue, the power of the purity of Jesus, flowed through her, the disease had no choice but flee her ravaged frame. And in the path of the retreating illness, strength advanced. The woman began to straighten up. Muscles, long atrophied through disuse began to fill with energy. Bones began to snap into place pulled and held by newly empowered ligaments. Her breathing began to deepen and oxygen began to seek out the musty corners of her being. Fresh blood began to course through her with a life-giving flood of health. “Who touched me?” Jesus asked. Amid the throng pressing Him for a multitude of reasons, He had felt the single desperate touch of faith. She fell at His feet and told her story. Those who had never noticed her before saw a whole woman. If anyone had known her before they did not know her now. 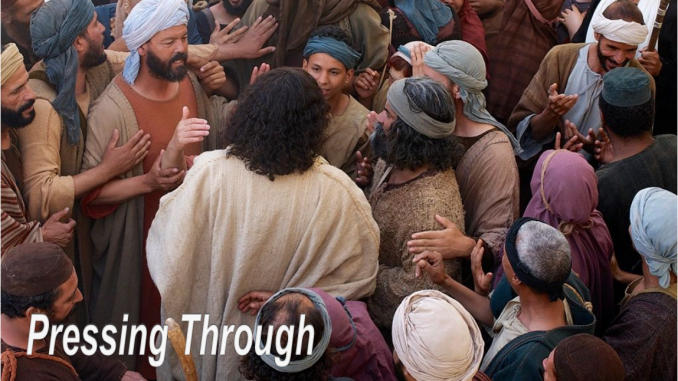 Pressing through–we all must do it to touch the Savior. This is what a worship service is—a time of pressing through to touch Jesus. This is our ministry as worship leaders: to call the people to a focus on Jesus, to press through the distractions of life, to touch Jesus with our worship. We can do this best in the public place when we have done it regularly in the Secret Place of private worship. We must press through our priorities. Sometimes our minds are crowded with conflicting drives and ambitions. 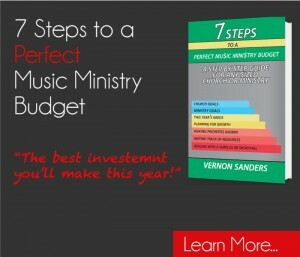 We want to serve the Lord, but we also serve music, a demanding task master. We are artists and we serve our various crafts. We have bosses and they have priorities that may or may not match our own. Our calendars and our daily agendas are as choked as the public square the day the sick woman pressed through to Jesus. But she did it. She pressed through. We must prioritize our glimpses of Jesus—our daily worship of Him. We must press through our crowded calendars and our saturated schedules to touch Him. He is the only one who can heal us, release us from the fruitless, endless errands life has sent us on and give us true strength of purpose, true focus of mission. We must press through the people. The crowd between us and Jesus is filled with people who have their own needs. We are not their interest. We are in the crowd that they must press through. Sometimes they can discourage us. Their words can weaken us and cause to think about giving up. Once in a while the Lord will send someone bigger and stronger to catch us at these weak moments, to lift us up and carry us along for a bit. They often deposit us within reach of the Savior. They have helped us press through. We must press through our pain. The illnesses and injuries we have experienced can loom between us and the Savior. We must press through. Several times each week I used to see a woman in our neighborhood on for her painful, therapeutic walk: twisted legs, straight aluminum crutches and a slow, tortured process down the sidewalk. But she was pressing through. So must I. I can press through that betrayal. I can recover from that disappointment. I can walk again, perhaps slower than before, but I can walk again. Jesus is in my sights and I must get to Him. With or without the help of others, we must touch Him.